When I told my grandmother that I was reading a book about Sri Lanka, she was enthusiastic to share with me her own knowledge about the country: “I never knew where Sri Lanka was, but then began to see it appear on a lot of clothing tags. It’s off the coast of India.” (And no, my grandmother doesn’t know this fact due to being a perpetual shopper. For ten years she worked as a boutique lady once a week at Steinmart. She was recently rewarded with a lifetime 25% discount for all purchases due to her outstanding dedication. Needless to say, I have a hunch that most of the family's Christmas and birthday presents were once merchandise at this store.) I was fortunate to learn about Sri Lanka through a different means other than textiles. I started voice lessons at a very young age. (My mother nearly had a car accident with me attempting to sing “Der Hölle Rache” in the back seat, and decided that I needed to learn some different music.) While taking lessons at Converse College in Spartanburg, SC, I met rising operatic soprano from Sri Lanka, who has since sung with the New York City Opera - shout out to Tharanga Goonetilleke. This led me to have an interest in the country. I was subsequently distraught with the 2004 tsunami which devastated the southern coast of the island. That being said, I did not know very much about the country, let alone its government or conflicts. When I was searching for a book, I came across a book entitled Tea Time with Terrorists: a Motorcycle Journey into the Heart of Sri Lanka’s Civil War by Mark Stephen Meadows. The concept of terrorism is a very sensitive – but also a very relevant – topic in our modern world, which made me look at the book several times. It claimed to not only explain the conflict within the island of Sri Lanka, but also aspects into the history and evolution of terrorism. The author traveled extensively throughout Sri Lanka, documenting his experience through photographs, videos, illustrations and writings, many of which can be viewed on his website. While I personally enjoyed the book and the author’s voice, I will note that there are not chapter-by-chapter notes, nor is there an index (which would make it much easier to find pertinent information.) Instead, there is a glossary, a selected bibliography, and timeline. Some aspects of the book that I would like to mention are: 1.) the Sri Lankan life (outside its capital of Colombo); 2.) suicide attacks; and 3.) the role of the media. The author had the opportunity to experience the Sri Lankan life firsthand. He spent a long time in the countryside, and in fact, made a trip to Tamil-controlled northern areas of the country by motorcycle. His experiences are certainly eye-opening. 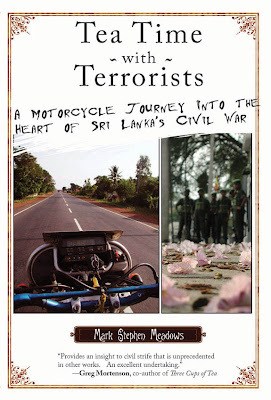 Another aspect that I found especially interesting is one of the assertions made by the author that Tamil militant groups developed and put into practice suicide attacks. The author goes into the development of many of the terror groups on this island, their associations with terror groups in several countries of the Middle East, and their practices of suicide attacks. The author also discusses the role of the media, and how one group’s use of the media can change the world’s perception of a conflict. This made me wonder about my own perceptions on conflicts, and how these might not represent the true nature of these conflicts.